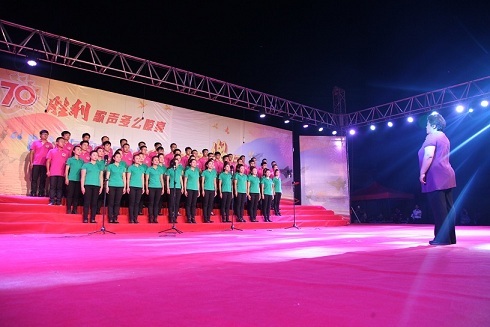 A choral concert to commemorate the 70th anniversary of the victory of the war the worker_Hubei Aviation Precision Machinery Technology CO,LTD. Late on September 1, aerospace to commemorate the 70th anniversary of the victory of the war and to celebrate the 66th anniversary of the founding of the "singing aerospace workers chorus concert held ceremoniously in aerospace area C football stadium. Company secretary of the party committee Huang Zhaohui was invited to attend the performance and cheering team for the company. Company team neatly dressed soberly T-shirt on the stage, deduction smoothly completed "under the brilliant sunshine", "the soul of the Chinese two tracks. Before the company team experienced in just half a month of intensive training, our players to overcome difficulties, the use of work and rest time for training on Saturday, often one station is an hour or two, from unfamiliar songs to uniformity of singing, a lot of effort. Company team average age 26 years old, is one of the youngest members of the team have been team, some people say that catic essence in staging machine. It's all youth, yes, we are young, vibrant, we high-spirited, we take the young youth vitality, passionate, singing loud, express the love for the motherland, for the motherland great Renaissance dream fighting hard, with an unyielding and determination.